With the first interview successfully completed, a prompt and professional thank you letter is the next order of business. Thank you letters play an important role in the job transition strategy. They are designed to resell the hiring manager on your capabilities and shows added professionalism that could make the difference between you and another candidate in the final decision. 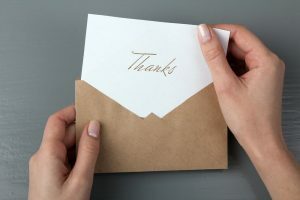 Dozens of hiring managers have commented that a professional thank you letter was the final motivator in their decision to pursue a particular applicant. There are a few key ingredients when it comes to writing a candidate thank you letter. Follow these steps to impress your hiring manager and land your dream job. Why Should You Write a Thank You Letter? Remind them of your conversation – You likely weren’t the only candidate the interviewer talked to, so reminding them of what you spoke about in your interview is a great way to recall what you talked about and who you are. Reinforce your skills – Remind your interviewer why they talked to you in the first place and continue highlighting your unique skills. Correct any miscommunications – If you forgot to mention something during your initial conversation or wanted to clarify an answer that you gave, you can use your thank you letter as a way to correct or emphasize what you said. What Does a Thank You Letter Look Like? A good thank you letter contains three main elements. These elements are broken up into individual paragraphs, with each paragraph serving a specific purpose. Be sure to carefully follow these guidelines to form a professional thank you letter and get you that next interview. The first paragraph appropriately thanks the person who took the time to interview you. You should mention the position you applied for as well as briefly acknowledge any other members in the room. The second paragraph is the most important and addresses specific background or experience you possess which matches the most important features of the position. One way to express this is by utilizing bulleted accomplishments to resell your fit for this role. Your list should include no fewer than two items and no more than five. The third paragraph of your thank you letter should include thanking the interviewer for his or her time once again and expressing your continued interest in the position. It is important to let the hiring manager know you genuinely want to pursue this position and desire to move further along in the process. Sign your name and send your letter within 24 hours of your interview so the information is fresh in your head and easy to articulate. For more specific questions regarding candidate thank you letters or advice on the application process in general, talk to J.L. Nixon Consulting. We are knowledgeable about what insurance companies are looking for, and can help you find your dream job today. To learn more about our services, contact us at (210) 649-1500.